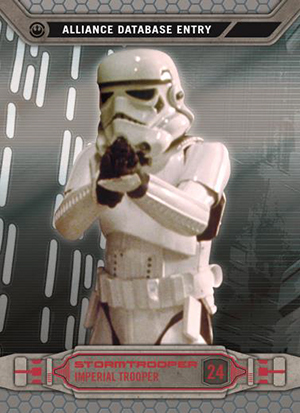 2014 Topps Star Wars Chrome Perspectives is just the second time the card maker has brought the popular Chrome name to a galaxy far, far away as a standalone set. With it comes one of the brand's staples, Refractors. 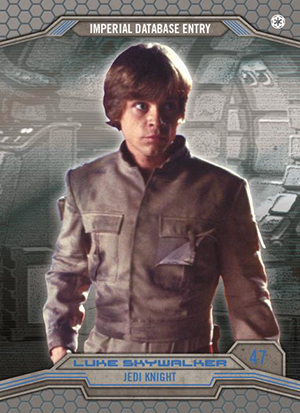 This also marks the first Star Wars set in a long time that doesn't rely on stickers for autographs. The base set has 100 cards. 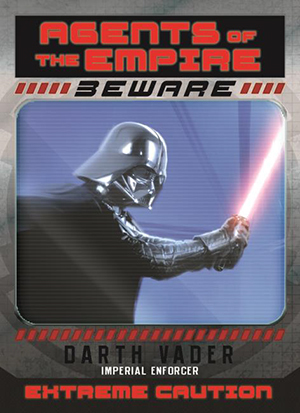 The checklist focuses a lot on the characters of the Star Wars Universe. 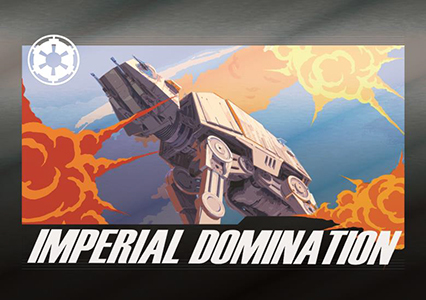 Half of the cards are shown from the Alliance's side, while the other switches to the Empire. Every pack includes a basic Refractor parallel, which is noted for its rainbow finish. The product also has four additional types of numbered Refractors: Prism (#/199), X-Fractor (#/99), Gold Refractor (#/50) and Superfractor (1/1). 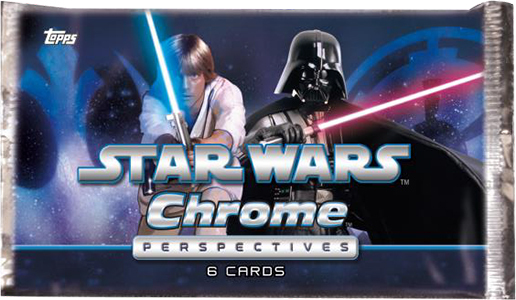 2014 Topps Star Wars Chrome Perspectives hobby boxes come with two hits or premium inserts. A Helmet Medallion card is guaranteed. 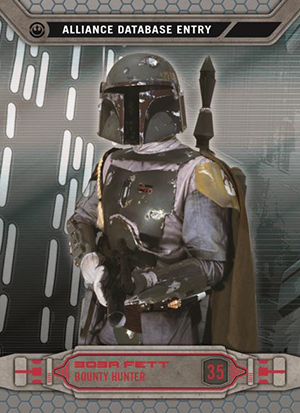 These have a piece of metal on the card that's done to look like an iconic helmet from the franchise. Helmet Medallion cards come in both silver and gold versions. Gold parallels are limited to 50 copies each. The second hit is either an autograph, sketch card or one-of-one Printing Plate. Autographs come with on-card actor signatures. 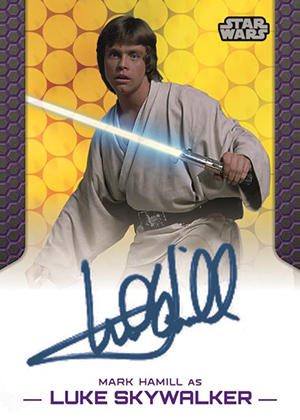 This is the first Star Wars set since 2005 not to use sticker autographs. 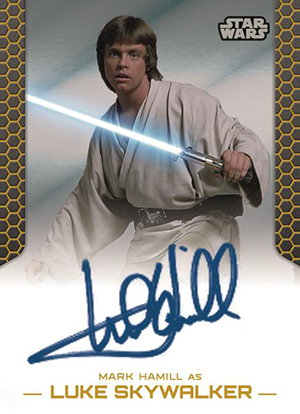 There have been a handful of autographed sketch cards since then, but all regular autographs since 2005 Topps Star Wars Episode III: Revenge of the Sith Widevision have relied on stickers. Besides basic autographs, there are Gold (ten per signer), Superfractor (1/1) and Printing Plate parallels. Sketch Cards put a bit of a new spin on the art format. Cards come with a chromium frame, which means the actual sketch area will be smaller. 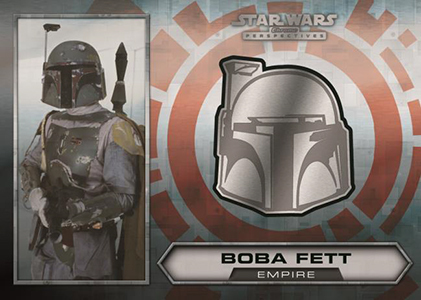 2014 Topps Star Wars Chrome Perspectives packs also come with one basic insert. 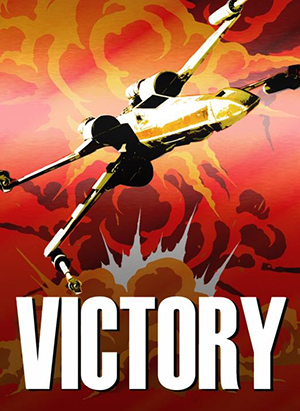 These include Rebel Wanted Posters (1:2 packs), Empire Priority Targets (1:4 packs), Rebel Training Cards (1:8 packs), Rebel Propaganda (1:12 packs), and Empire Propaganda (1:24 packs). Each basic insert set has ten cards. 2015 Topps Star Wars Chrome LUKE SKYWALKER SKETCH 1 1 BY MARK HAMMERMEISTER! Approximately 5,000 total cards. Inserted 1:91 packs. Click here for a detailed guide. 1 card. Inserted 1:36,500 packs. Topps confirmed print run of 5 copies. Distributed via redemption. Card uses stickers for signatures. 30 cards. 1:30 packs. Click here for a full gallery and short print info. 6 WHAT R2 KNOWS, EVERYONE KNOWS! Good: On-card autographs, Chrome is a fresh angle, Refractors add a character-collecting element, dueling points of view makes for a fascinating read. Bad: Sketched look of Wanted Posters does not work, some of obscure characters have poor images. 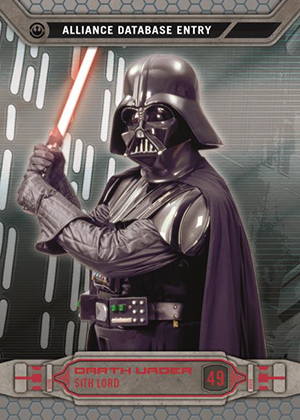 The Bottom Line: 2014 Topps Star Wars Chrome Perspectives feels fresh in a lot of ways, but very familiar in others. Sketch cards are nothing new. Most of the autograph signers are somewhat regulars. 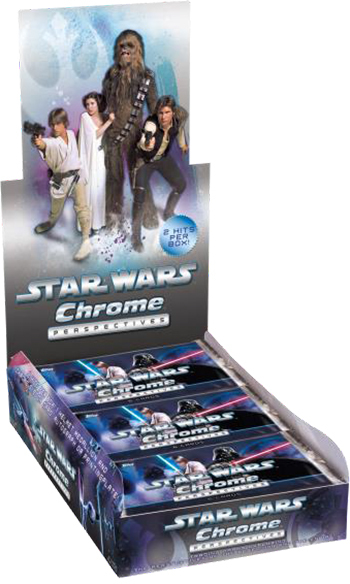 But with Chrome being such a big part of the sports card world, it’s strange to see that it has been largely overlooked with Star Wars, especially in the last decade. So that’s refreshing. The on-card autographs are also a great thing, even if they’re pretty tough to pull. This isn’t a perfect set, but it’s one that shows a lot of promise if Chrome continues (and it should). It’s also a set where it’s important to take the time to read the backs and immerse yourself in the content beyond just the images and shiny stuff. Chrome gives a new look to a very familiar card subject. Star Wars Finest was an all-art set with full images on the front. Chrome Archives took cards from the original film and simply Chromed them up. Outside of inserts, this is the first time a new design has been done with the format. Most are solid, although some of the most obscure characters have fuzzy images or ones that are so dark, they’re hard to make out. The best base cards are the ones that have minimal background elements. The contrast between these lighter backgrounds and the character image make the style pop. This is even more so when you move to the Refractors. One thing that’s missing from the cards is etching. These outlines used to be done by Topps, but it seems they don’t do it any longer. That’s too bad. Etching adds a nice textured look. The lines of the top and bottom borders would have worked very well like this. The Wanted Posters are a major disappointment. The pencil-sketched artwork is nice, but it doesn’t work with the dark look of the chromium. Making things worse is the fact that they’re so easy to pull and you end up with a big stack after a box. And while the Training and Propaganda Poster sets look better, they still seem a little out of place with the technology. They certainly belong with the dual point of view focus that explore both the Republic and the Empire, but not so much the Chrome format. After nearly four decades of Star Wars cards, I’m amazed that the crew working on these are able to come up with fresh angles for new sets. Chrome Perspectives isn’t a one-note product. Look closely and you’ll notice there’s a lot happening with the theme. Initially, I was taken aback by the dual checklist with R cards and E cards. But the way it’s executed is actually very interesting. 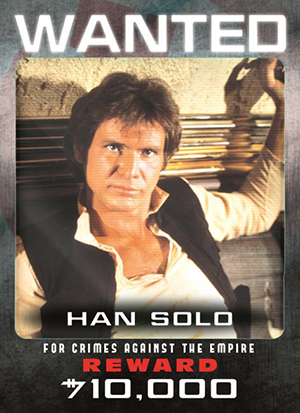 R cards describe characters from the POV of the rebels. In a nutshell, Princess Leia is good, Darth Vader is bad. It’s the reverse for the E cards as they’re presented through the eyes of the evil Empire. Coming close on the heels of the largely character-driven Galactic Files sets makes it a little redundant in some ways, but there’s still some freshness in the spin. I was pleasantly surprised with how strong the autograph list turned out. The shift to on-card autographs could have made it easy to go with a checklist of lesser names and holdout the premier stars for an ensuing set that might be a tougher sell. Instead, there are several marquee names and a surprise triple autograph that should be a crown jewel in the hobby. This is one of those products that appears to have been under-ordered, leading to a smaller print run. The Gold Helmet Medallion parallels went from an announced print run of 100 down to a final run of 50. Every case has a hot box of five hits instead of two. These sorts of things bode well for the overall break as there’s a decent chance of getting more than you might have bargained for. And even if you do hit the stated odds, things like the Gold Refractors and other parallels are turning out to be not too tough to pull. The autographs offer some massive names. 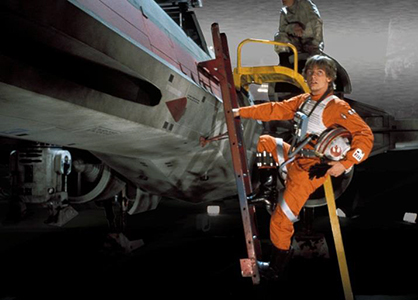 You shouldn’t hold your breath at landing the triple autograph, but there’s nothing wrong with landing Mark Hammil, Carrie Fisher, Anthony Daniels, James Earl Jones or Harrison Ford. Even for the lesser names that have signed before, the on-card signatures give most of them something new. Sketch cards will no doubt vary, but that’s always the case. It would be nice to see a higher percentage of better quality sketches, especially when you compare it to the standards other companies have. With the inclusion of Refractors, there’s a better way to land some nice cards that might not normally be considered hits. They introduce something of a player collecting element to an entertainment product, something that doesn’t really happen on this side of the hobby. Like sports fans with their favorite players, the Refractors can draw in collectors who have favorite characters. I know I’m doing it with Jabba the Hutt and have heard from other collectors looking for others. At first, I was ripping packs looking for Refractors, autographs, medallions and sketch cards. That was the initial rush. With so many Refractors (one basic per pack plus a handful of numbered ones), it was fun to take a quick marvel at them. It was after sorting through them all that the themes and intricacies came through. As awesome as it is to have on-card signatures and the possibility of other big cards, it’s this commitment to theme that ultimately makes Chrome Perspectives stand tall. Click here to check out some of the highlights from a box break. Star Wars Chrome Perspectives Allen Shoshan Secura Shaak Ti Dual Auto 103 200! Star Wars Chrome Perspectives Cottrell Piell Jensen Fisto Dual Auto 187 200! Matt � Yes, but only the second for the Topps Chrome name. Similar concept, for sure. But in sports where both have deep roots, there’s a difference as far as brand reception. 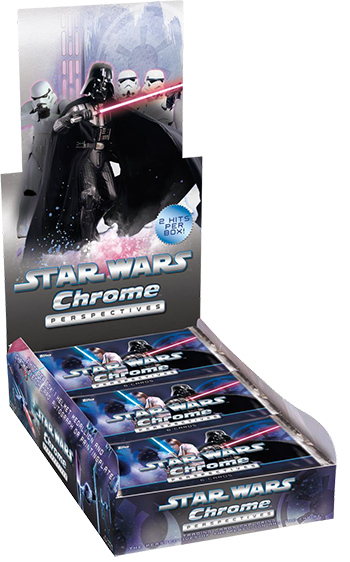 What’s the difference between the Star Wars Chrome Perspectives USA Edition/Version and the UK Edition/Version? BiP � I just heard of the UK version tonight. The UK version is NOT Chrome. Also, autographs are stickers and no sketch cards. We’re compiling info and should have an article up shortly. So, I notice that in the autograph insert, you have a redemption card for Ford. I can find other redemption cards for the three autograph cards and for a Ford printing plate… Does the Ford autograph card count towards the gold and superfractor parallel sets as well? 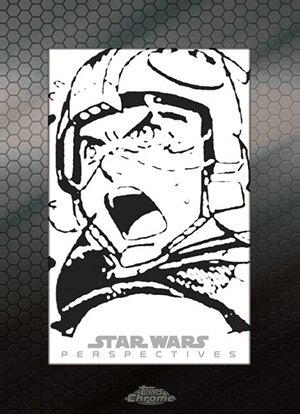 The perspectives two sketch card redemption card are they 1/1…. autographed…. if so by who and who are the sketches of?